I am back with my fourth and final guest design post for Newton's Nook! I gotta say, I have had soo much fun making all four of these cards! I cannot tell you what an honor it's been to share some Newton's Nook creativity with you all. 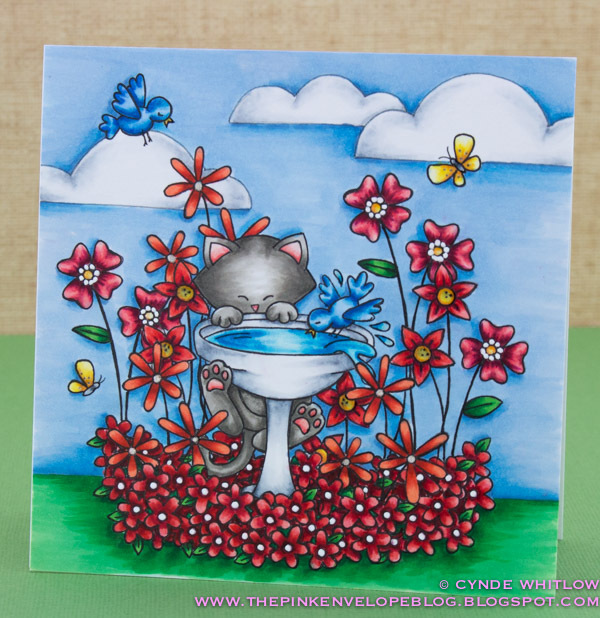 I knew I wanted to use Newton's Birdbath on my card today. I mean seriously peeps, you could stamp this image on a card panel, color it and call it a day. It's so cute and could totally stand on it's own for a clean and simple card. I however, cannot leave well enough alone. 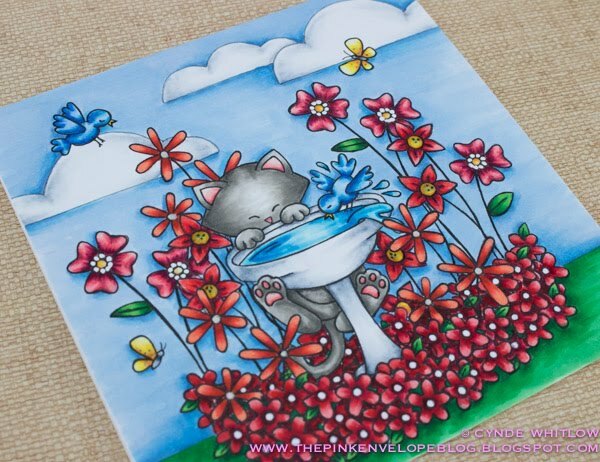 If you've been following along with me, you will see that I had used the Versatile Vases Stamp Set on THIS card. Since I already had the masks cut for that card, I thought I would take advantage of that and use them again. I stamped all of my images on a 5"x5" White Card Panel with a Copic friendly black ink. Remember when you mask out a scene folks, always work front to back! It can also be super helpful as you work front to back to also stamp from the sides towards the center of your panel. These flowers would look super fab in lots of different colors, but I took my inspiration from my neighbor. She does a theme of colors in her flower beds every year. This year, the entire bed is different shades of red. 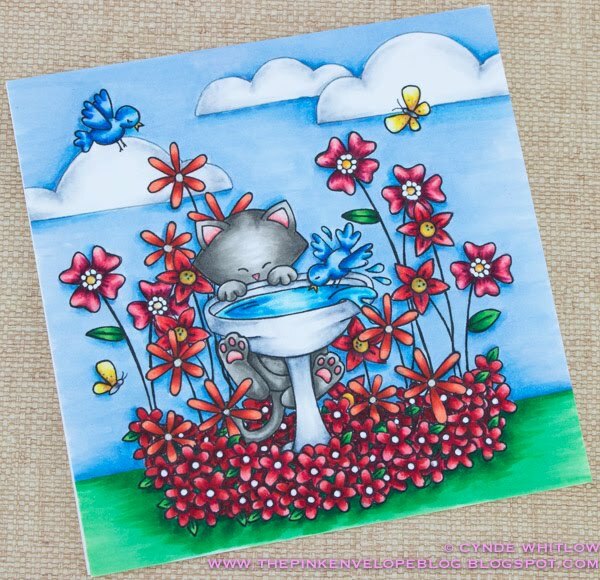 Using the stencils I had made from the Sky Borders Dies Set on THIS card, I used a Grey Copic Multiliner and traced in some clouds. You could use black, but I figured since I was going to color in the entire background and there is allll of that red, grey would be better. For my Copic color choices, I used 3 different color families of red as well as the blue. That's a whole lotta of red and blue ladies and gents. To finish of my card, I adhered it to a White Cardstock Card Base. Then I added some Clear Wink of Stella to the clouds and center of some of the flowers. On the daisy shaped flowers, I added some Sakura Stardust Glitter Pen. Last, but certainly not least, I used a Sakura Clear Glaze Pen on Newton's nose, the pads of his feet and the butterflies. That's it! I hope you've enjoyed my cards folks. Thanks so much for stopping by to see me, it's been a blast! FABulous card! All the flowers are amazing and I love the vivid colors. I love how you colored the flowers. Just gorgeous. And the kitty....this is just so cute.